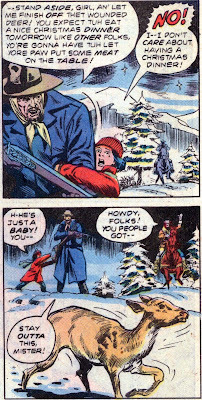 Since Chris gave a recap of the Legion Christmas story that appeared in the 1980 Super-Star Holiday Special, I thought I would post the entire Jonah Hex story. 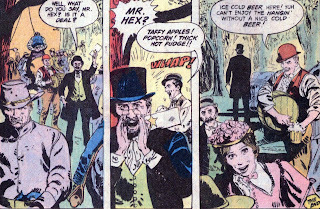 I shall refrain from wishing you a Merry Hex-mas, but I will wish you a very merry Christmas & I hope that you are blessed in an unexpected (or even expected) way. 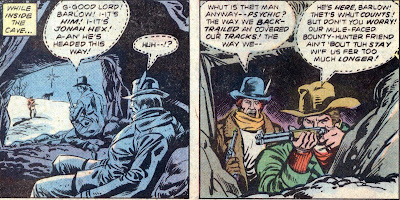 In addition to Jonah Hex, my other favorite character in comics is Uncle Scrooge. Carl Barks is one of my two favorite writer/artists (Don Rosa is the other) and I always enjoyed the Christmas stories that he wrote. My 2nd favorite story is "Christmas in Duckburg" from 1958. A few convoluted things happen to bring this story to it's payoff. Scrooge was humiliated at teh town Christmas dinner last year & has promised to bring for the town a tree that will be taller than the clock tower. Donald has some catalogs laying around the house and he tells the boys they can ask for anything in the catalogs (because he know the most expensive thing is a bike). The boys pick a ferris wheel and then donald learns that there was a carnival supply catalog in the pile. 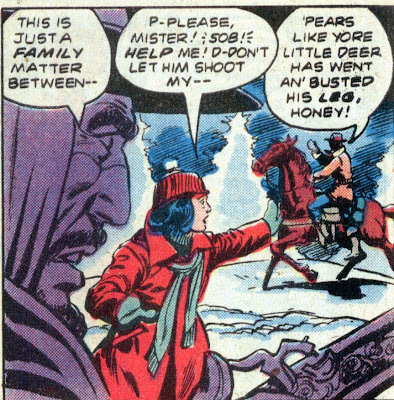 He has to go to Scrooge to ask for money. 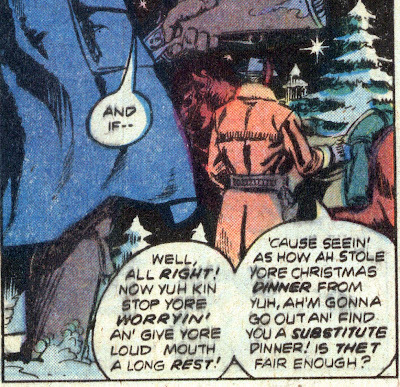 Scrooge agrees if Donald & the boys go to Canada to get the 100 ft tree. Meanwhile, a local business owner that had a bet with Scrooge about the tree finds out about Scrooge's plan. 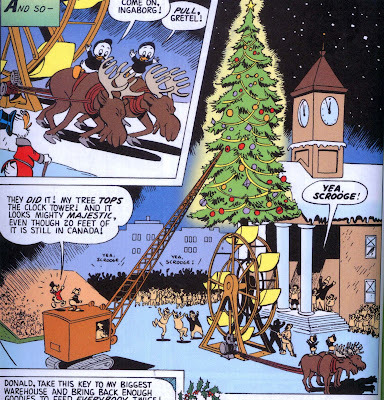 Not wanting to be shown up by Scrooge, he enlists the help of the Beagle Boys to cut 20 ft off of Scrooges tree, so it won't be taller than the 84 ft clock tower. After Donald & the boys leave, Scrooge wants to up the ante and sends a telegram to Donald. 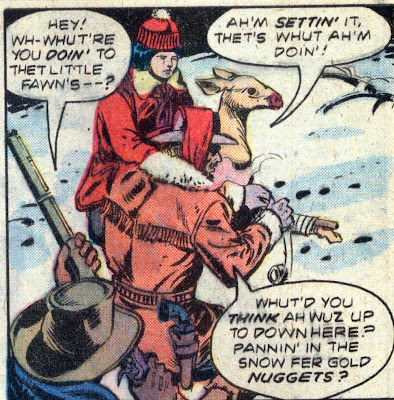 In an odd happenstance, the telegram is altered so that Donald thinks Scrooge wants them bring home 100 moose. (they only end up with two). 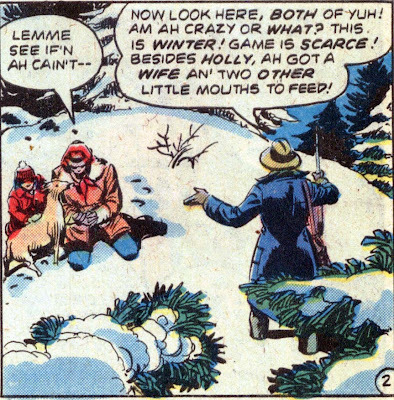 Once they get back home, they learn that Scrooge wanted 100 geese to weed Duckburg and he is the laughing stock with the two moose, but he is determined to save himself with the gigantic tree. Once it is stood up it is too short! Donald gets the idead of putting the tree on the ferris wheel and rotating it so the tree is taller than the clock tower, but Scrooge didn't spend the extra money for a motoe. The boys hook the moose up to the cable drum and use them to turn the ferris wheel. 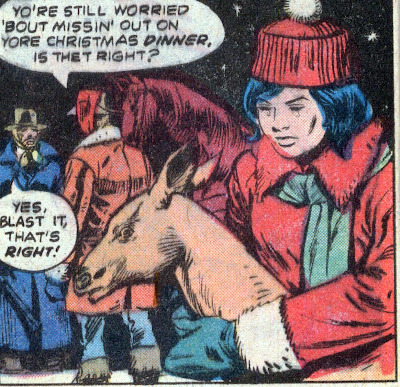 That is one of my favorite Christmas comics images in my head. Thank you Carl Barks for creating it & thank you Gemstone for reprinting it this month in the CHristmas Parade book. 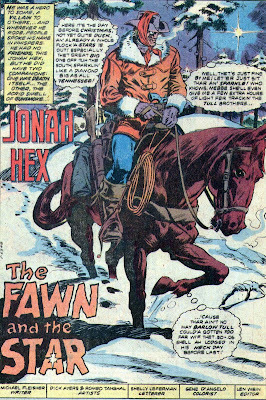 The New Origin of Jonah Hex. 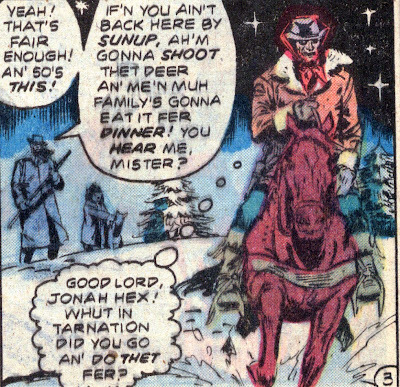 Finally got my hands on Jonah Hex #14. Whoa. I really enjoyed the storytelling style in this one. 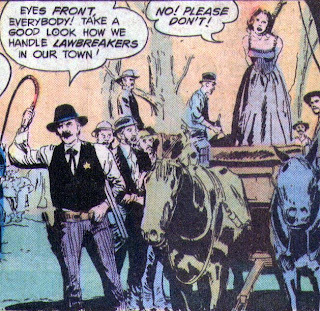 The captions were written as if they were a dime novel from the period. The language just flowed, not unlike the letters that were read during Ken Burns "Civil War" documentary. 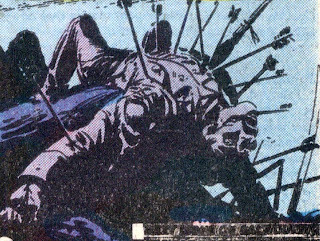 This issue dealt with Jonah's father selling him to the Apaches, his saving of the Apache chief, and his betrayal by the chief's son Noh-Tante. 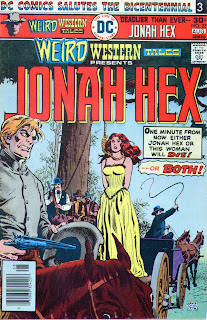 There were a few minor changes as compared to Jonah Hex #8 (vol 1) . Jonah isn't traded to the Apaches for a pile of pelts, but is swapped for safe passage for his father. Also, he is not saved from the Kiowa by white Indian-killers, but overcomes the Kiowas alone. A great issue, I won't ruin the best part, just go buy this and enjoy it. 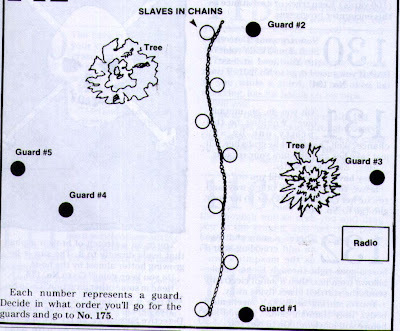 They lead the slaves into a clearing. A beefy character pounds some stakes into the ground and fastens the chains to them. The other guards sit around, eating & drinking, while it turns dark. Try to free them by taking the guards out one by one? Try to free them by walking in & starting shooting? Voting will end on 12/26. Results posted on 12/27!! 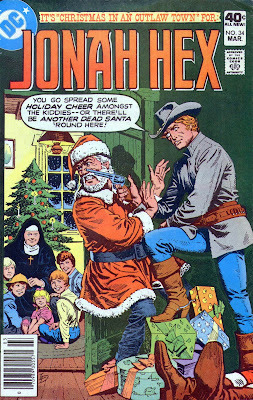 ..... a dead Santa on the floor, and a hideously scarred man holding a pistol in Santa's face. Where are your elves NOW, Fat Man? 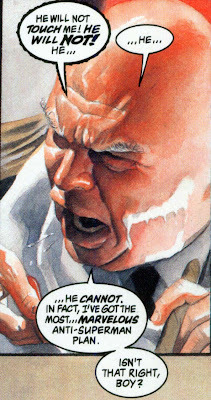 Lex Luthor, former President, evil genius, and a very very very angry man. What makes him so angry? I don't think you really want to know, because it is said that what makes one man angry, can bring another delight. Just when you thought elfs were the good guys. He is wearing a swimsuit, but grainy photography can be your friend. 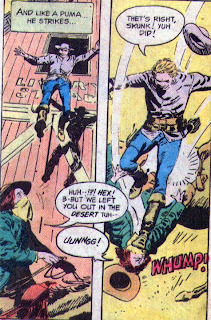 Jonah Hex #8 Vol. 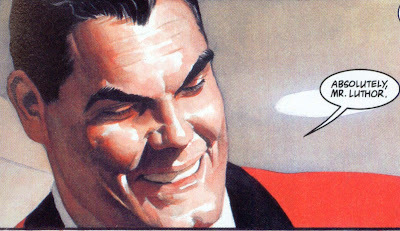 1 "The Mark of the Demon"
"The Mark of the Demon"
This story, continued from last issue, is stated as taking place "Spring, 1874". Ooookay, 1874 it is. 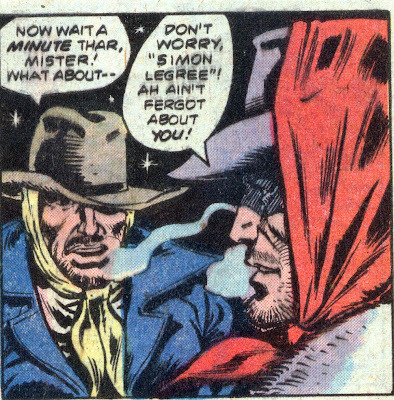 (Mr. Fleisher, you're killing me here with your continuity). 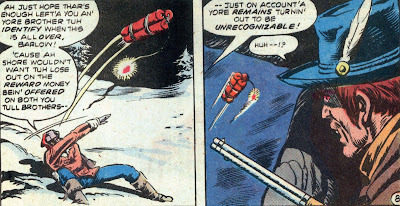 We are treated to a splash page stating that Jonah is tracking the Apaches that have kidnapped Adrian Vaden. 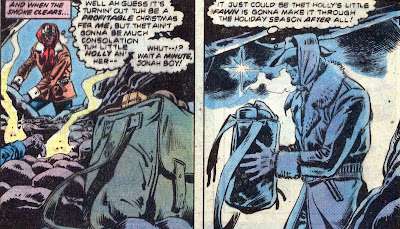 Then we get a 1 page recap of the flashback and on page three we pick up when Jonah is captured by the Kiowas. They tie him to a stake & get ready to burn him alive when suddenly the camp is attacked by white men who slaughter Indians for their scalps ($25 each at Fort Hastings). They kill everyone in the camp, including slitting the throats of two Kiowa children. When Jonah, whom they have just freed, protests, they gut shoot him & leave him for dead. 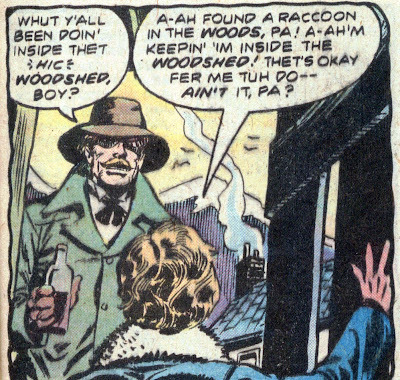 Several weeks later, Jonah awakens in the cabin of an old trapper. It is not revealed how the trapper found Jonah, but he nurses the boy back to health through the summer & fall & into winter. Jonah walks for three days to find the Apache camp, but it is deserted. Then we get a montage of Jonah as a "wanderer on the frontier", a buffalo hunter for the Army, a tracker, a scout, and then in the Civil War at Chancellorville (May 1863), Vicksburg (July 1863), Shiloh (April 1862), Antietam (Sept 1862). Therefore, the Fort Charlotte Massacre occured sometime after July of 1863. After the war is over Jonah comes upon a wagon that has been destroyed. Looking through the ruins he finds Noh-Tante's medicine amulet. Within the week he finds the Apache village and meets White Fawn. She explains that she has wed Noh-Tante. Jonah confronts the chief and explains how he was betrayed by Noh-Tante "twelve years before" (so we are now in 1866). The chief declares that this arguement must be decided in a tomahawk fight. During the battle Jonah accidentally hits a tree and the handle on his tomahawk breaks. Noh-Tante holds Jonah down and gloats that he had weakened the handle so that it would break. Jonah, about to die, grabs the knife he keeps in the collar of his coat & stabs Noh-Tante. Jonah has broken Apache law by using a weapon other than the tomahawk and he must pay a price. The chief explains that Jonah had saved his life once but then killed his son, so the world must know that Jonah is half good & half evil. 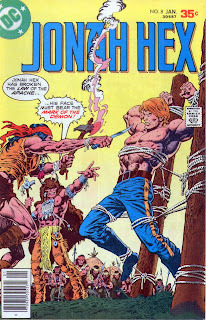 They tie Jonah between two poles and press a heated tomahawk into the right side of his face. He is kicked out of the camp & told that he will be killed if he ever returns. 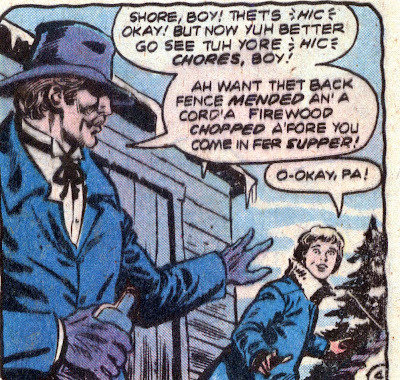 Back in present day (1874), Jonah locates the Apache village where Laura is being kept. An Indian attacks him from behind, knocking him unconscious. He awakens tied before the chief, his one-time 'father'. The chief explains that come dawn Jonah will be tortured and then burnt alive. 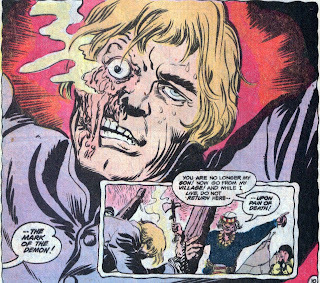 Later that night, White Fawn stabs the brave guarding Jonah and then frees Hex. She is going to escape with Jonah but the chief kills her with an arrow in the back. 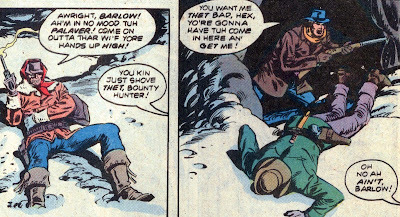 Jonah shoots & kills the chief, grabs Laura and starts to escape. 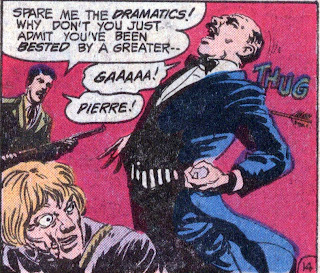 As they ride away, they are ambushed by Count Henri D'Aubergnon & Pierre (remember them?). Now the Count knocks Jonah off his horse by bending a tree over, tying it down and cutting the rope, letting the tree spring back. looking at this tree I'm wondering that if the Count can bend a tree that big around, why didn't he just grab Jonah & break him in half and eat his organs? 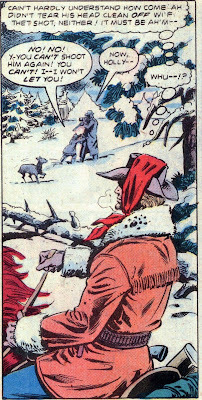 The count ties Jonah up and Pierre takes up collecting arrowheads. 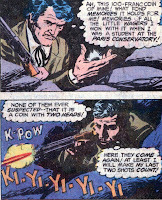 The Count frees Jonah and together they are able to fend off several waves of Apaches attacking. Jonah decides that one of them can save Laura if the other provides cover. 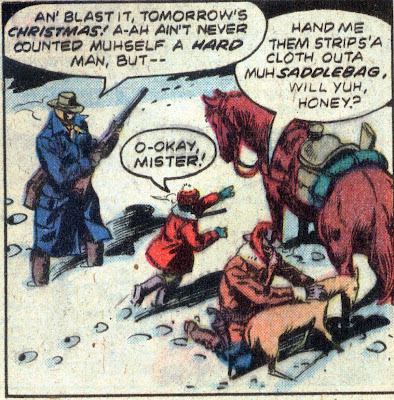 The Count falsely states that he has enough ammo to last hours (he has two bullets). Jonah & he argue about who will stay & who will go. The Count suggests the toss of a coin. Heads, he will stay, tails, Jonah will stay. It comes up heads and Jonah rides off with Laura. 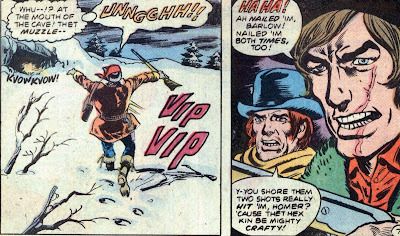 The Count ends up fighting the Apache with just his saber. Laura:"Did you ever study French, Mr. Hex?" Laura:"Well, I was just thinking how funny it is that when we were leaving, the Count called out "adieu" to us. In French, that means 'farewell'. Laura: "Well, when you're expecting to see someone again, you're supposed to say 'au revoir', which means 'until we meet again'." 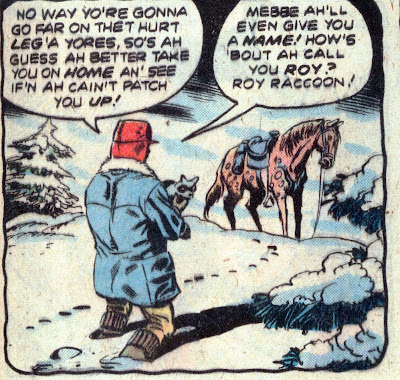 reminds me of a Jack Davis EC book. Timeline: Whew! 1874, 1866, 1862, 1863, 1854, all over the place. Overall this was a great issue. 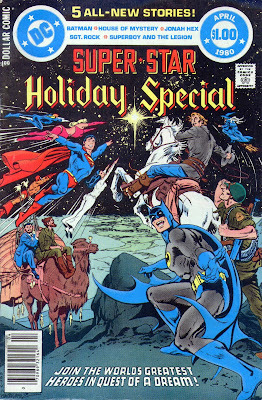 The art by Ernie Chan/Chua was good but Alcazar's inks weren't refined enough to make this stellar. 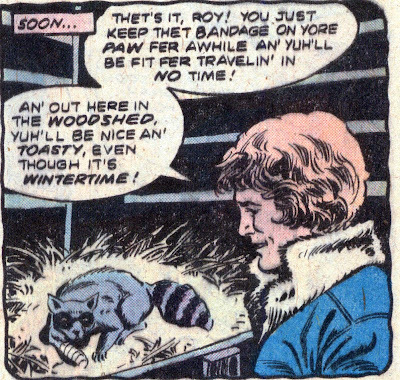 Major awards go to the last panel. The cover has Jonah wearing Union Blue instead of Reb Grey. 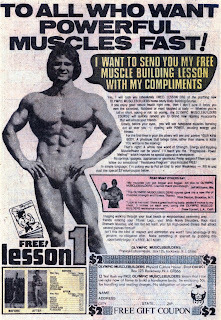 Next Issue: More exposing of sweaty man-flesh, a vast Mexican treasure, and an awkward moment....Not that there's anything wrong with that.